After initially booking our flight to Helsinki, my quest to find accommodation began. I had heard rumour that many hotels in Finland were generic and dull, but I read a blog about a girl who had stayed in a hotel in Helsinki that was originally a prison and my interest was piqued. Using other travel blogs about Finland, and the wonderful search engines of Google and Kayak, I started finding some pretty cool places to stay on our holiday. Omenahotel – Turku Although staying in a chain hotel wasn’t holding much interest to me – the idea of staying in a place that had no staff seemed worth checking out. Marketed as an affordable and clean place to stay, reservations can be made online or by the booking terminal found in the front entrance to the hotel. Once the reservation is confirmed, you are emailed a door code and a room number prior to your arrival. There is an emergency contact # should any problems arise, and there are security cameras in all the hallways to ensure the safety of the customers as well as to deter vandalism. The Omenahotel was about 300m from the Turku train station, and an easy walk to the main shopping and dining areas – it was also a very short distance to Turku’s club scene. Great if you are a teen looking to party and have a cheap unsupervised place to stay afterwards, but not the best choice for those requiring a quiet place to sleep. The rooms are basic, comfortable and clean although I found the main hallway smelled a bit off. A step up from a hostel, I’d recommend staying here if you are on a budget and aren’t picky about how much sleep you get. Half hostel, half hotel…this 1960’s cruise ship is permanently docked at the mouth of the River Aura about a 20 minute walk from downtown Turku. Despite being a distance from downtown, the S/S Borea is located directly beside the Marine and Navy History Museum and is a 5 minute walk to the Turku Castle. We arrived on a Sunday and the main reception of the hotel was closed but we could check in at the hostel reception just one floor down. The keys to our room were left for us, and we made our way to the 5th level of the ship. 2 single very hard beds were in one of the rooms, as well as a shower and sink only bathroom. In the second room there was a small loveseat, a television, a table and a toilet and sink only bathroom. Our portholes overlooked the river – a decent view of the cliffs across the river as well as the shipping cranes used to load and unload the huge cargo ships that frequent Turku. Although the experience of staying on a cruise ship for a night was pretty cool, comfort and customer service weren’t highlights of our night spent here. We did travel during the off season, which meant it wasn’t very crowded – but the hotel reception wasn’t expected to open until the following day, well after we had to leave to catch our early train. The hostel couldn’t accept our payment nor complete our paperwork for our stay so we left figuring with the original reservation they could charge our credit card. Another passenger/guest was in the same predicament, the whole process feeling cold and impersonal. A sauna is available for use for both the hostel and the hotel in the bottom of the ship, free in the morning but cost an additional 7 euro for use in the evening. There is a restaurant and bar on the ship, but both closed at 4pm leaving us having to head back into town in order to find a place for dinner. I would definitely return to Turku – their Castle as well as their pub scene worth the visit alone, but I would search out different places to stay rather than the S/S Borea or the Omenahotel. Technically, not in Helsinki…this hostel is found on Suomenlinna Island – a 15 minute ferry ride from Market Square in Helsinki. The ferry travels very frequently, every 20 minutes or so from 6am until 2am daily so getting to the Island is simple. 800 people live on Suomenlinna Island, and the Island has a grocery store, many restaurants and cafes, and is a UNESCO site as it is a unique monument of military architecture. The hostel is located in what was formally army barracks, then a school. Now a beautifully restored hostel, this building offers accommodation for youth groups and budget travellers year round. Although we arrived after the hostel reception has closed, a key with instructions were left in an envelope near the main entrance, as well as an emergency # in case we needed to get in touch with the staff. Our private room had 2 single beds, a chair, as well as sitting cove that overlooked the ferry terminal. The showers were across the hall from our room, and one of the two kitchens was just outside our room door. An easy 3 minute walk from the ferry, the hostel is also right next to the grocery store and the Island’s own brewpub. We bought some food for breakfast at the grocery store then headed to the pub to enjoy a delicious dinner and pints. The next morning, we met the girl who manages the hostel, and she was very welcoming, friendly and was sweet enough to send me my camera card and adapter I had accidentally left the room back to my home address. I don’t normally consider hostels when I look for places to stay on holiday, but a chance to sleep in an old fort was too good an opportunity to pass up and the Suomenlinna Hostel was easily one of the best choices for experience, location and service all around. After a long flight, I wanted a quick and easy place to stay that was close to the train/bus station in Helsinki. A 5-10 minute walk, depending on how quickly you get your bearings in a new city, the Hotel Finn was a nice choice of hotel to attempt my jet lag recovery. Hotel Finn is a boutique hotel, family run, and located on the 5th and 6th floor of an office building downtown. The elevator to reception was tiny and classically European, with a manual door I had to remember to keep pushing when I got to my floor as I kept waiting for it to automatically open. The staff were polite, the hotel quiet and well decorated. Breakfast wasn’t included but since you are right in the city centre surrounded my many food options, it wasn’t really a big deal. Decently priced, I enjoyed Hotel Finn and would recommend it as a centrally located, funky place to stay. Once again, I wasn’t pleased to be staying in a chain hotel but from what I know, GLO isn’t a huge chain and it came highly recommended on many travel websites. More pricey than I expected, considering it was a 15 minute walk to the city centre, it is a very classy hotel with all the amenities of a 4 star. The outside of the hotel is what attracted me to check it out – a beautiful old castle made of stone, with large doors and classic arched ceilings in it’s main reception. Our room had a super comfortable queen sized bed, with a open concept bathroom/shower only separated by tinted glass from the bedroom. Some of the staff were a bit snotty, and weren’t helpful with any suggestions on where to grab some cheap breakfast the next morning. One eye brow raised, the reception girl’s response to my breakfast question was met with “You are in Helsinki…nothing is cheap.” And then she turned and walked away. Although comfortable and very artistic, I don’t think I’d recommend the Hotel GLO Art as the location isn’t worth the cost, and the staff don’t really reflect the typical polite Finns that we had a chance to meet during our travels. My inspiration for investigating unique accommodation in Finland! Although obviously part of a massive world wide chain, I could not resist the opportunity to sleep in what was once a prison that only closed in 2002. Set in mostly a residential part of Helsinki but not far from the Market Square, this prison once held prisoners before their trials. The rooms have been made slightly bigger and equipped with double beds, desks, closets, sitting chairs and full bathrooms. The windows in the rooms are very high – expected of course, but the views of the hallway are much more interesting than the views you might get outside. Set up like the original prison, the hallways are massive, with open areas in the middle, and old metal staircases allowing passage onto different floors. In the basement of the hotel is the restaurant Jailbird, a sauna (additional cost), as well as 2 prison cells left in their original condition. One of the original cells is an Isolation Cell, and the other is a Group Cell – both hauntingly gloomy but worth checking out. The hotel is surrounded by a large brick wall, and wi-fi is free but tough to connect in the individual rooms…as the walls are made with thick concrete! The staff wear black and white striped prison shirts with prisoner ID #’s across the front, and can answer any questions you have about the former prison. A hotel, as much as a tourist attraction…as always you can exit through the gift shop and pick up some prison souvenirs including the prisoner shirts and handcuff keychains. Truthfully I thought for certain this hotel would be my favourite by far. Ridiculously expensive, I ended up working a 12 hour overtime shift just to spend one night in this resort – one of 20 glass igloo’s that would give you a full 360 degree view of the Northern Finland sky. It’s also primetime for the Northern Lights, and I thought there would be no better setting than this to see the Lights for the first time. Sadly, the skies were cloudy, and we couldn’t even see the stars which I’m certain would be brilliant when the skies were clear – summer or winter. The igloo was amazing nevertheless, and it was incredible laying in bed and being able to look up at the sky during both the day and the night. Despite the lack of privacy (a small curtain did circle the igloo allowing some privacy when you laid down in bed, and tinted windows in the small toilet room in a corner of the igloo), I never once felt vulnerable or exposed. During the busy season, maybe I would have felt differently, but the few neighbours we had seemed far enough away I hardly noticed them. The resort is located 40km south of Ivalo, so a car is pretty much necessary to visit. The resort is divided by a river, although there is a bridge that allows access to both sides. The glass igloos are located on the south side of the river, and the log cabins also available for rent are on the north side. The main cabin with the restaurant, bar and gift shop inside is on the north side as well…as are the showers and the sauna. I didn’t mind paying for the experience to stay in a glass igloo, however having to trek through icy paths to get to a shower or sauna took away from the experience. Thankfully winter hasn’t come into full swing yet in Lapland, and the weather wasn’t freezing or the paths buried in snow. The buildings including the showers/sauna were slightly difficult to find as the map of the resort provided wasn’t always accurate. In addition to the chilly trek to the facilities, the staff at the resort seemed indifferent and at times abrupt. I’m not certain the owners nor staff were locals, and as it was just the start of their busy season, maybe they will improve/warm up in time. 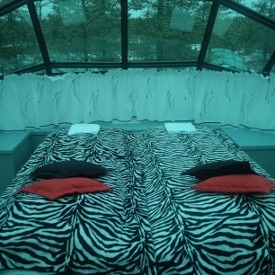 The experience staying in the glass igloo’s was worth the cost, no doubt. But I can be pretty sure it will only be a once in a lifetime stay. And the winner of my favourite place to stay in Finland is…GUESTHOUSE HUSKY!!! Located a short drive from the Ivalo town and airport, this new guesthouse was one of the highlights of our adventure in Finland. Located on a side road a few kilometres off the main highway, this guesthouse was the closest place I found to the experience of staying with good friends or family. Only able to accommodate 16 guests at one time, this small guesthouse is welcoming, comfortable and run by a wonderful family. The man of the house runs a Husky Farm, home to more than 150 Alaskan and Siberian Huskies. He runs dog sledding tours during the winter months, a very popular attraction in Lapland. His wife started the guesthouse a few years ago, noticing the need for local accommodation for the tourists that venture north to experience dog sledding, snowmobiling, and skiing. Home cooked meals are provided at an additional cost, and both the breakfast and dinner we had there were some of the best meals we had in Finland. We were able to visit the dogs, pet and photograph them. There is an amazing sauna in the guesthouse that all guests are welcome to use whenever they wish. Rooms are both comfortable and well decorated. The owners live the house next to the guesthouse, and their sons can be seen going to and from school and assisting with the chores. Reasonably priced, friendly staff, delicious food, beautiful location with so much to offer to enjoy the true nature of Lapland, I’d like to think that one day I’d be able to come back and visit Guesthouse Husky again. Boats, Hostels, Guesthouses, Igloos, Boutique Hotels, Prisons and Castles…I’d say that Finland has some of the most unique and interesting places to rest your head while on holiday. Have you visited any other types of accommodation while staying abroad? Please pass on any experiences and recommendations!